I'm thinking about purchasing - what happens when I do? Within a few minutes of your purchase you will receive the ebook in your email - and you can get started learning right away! If you have purchased a video subscription then again, another email will have your username and password and you can log in and start watching and learning. If you have ordered a print book, it will take a few days to arrive - but I will be in touch and let you know the ETA. I'm a complete Beginner - will your course be able to help me? 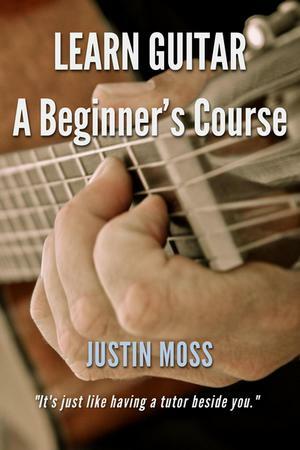 Yes, the Beginner's Course takes you right from the beginning - presuming you have never even touched a guitar before. What type of guitar do you recommend to start on? I personally recommend a nylon-string acoustic guitar for beginners. They are softer on tender fingers, and easier to press the strings down with. If you have very small hands, then a steel-string guitar may be a better option, but your hands will stretch as you learn. Best thing is to go visit your local shop and talk with the representatives an get their advice. Don't buy the cheapest option either, always go up a couple of notches. 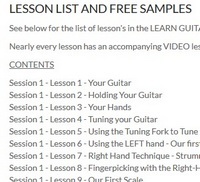 Does the Beginner's Course teach how to tune the guitar? Yes, it does cover tuning the guitar. I usually recommend to new players to purchase an electronic tuner (about $45), as it takes quite a while for the ear to develop. Then you tune the guitar manually, and use the tuner to test yourself. After a while you start to get better and tuning and eventually you are able to manually tune easily. Are the Courses suitable for electric guitar? You can use these courses on either electric or acoustic guitar. When starting out on the guitar, acoustic and electric styles are identical. It is only much later, when all the fundamentals have been learned, that the two styles can split, for example into electric rock, or acoustic fingerstyle. What styles of guitar do the Courses cover? 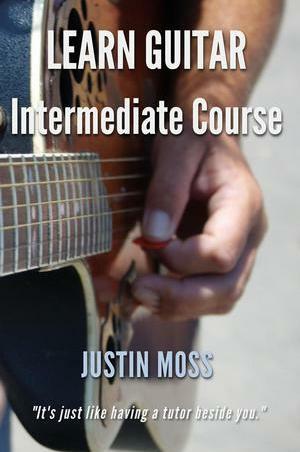 The Courses cover "modern" guitar ideas. With modern, it thoroughly covers strumming, picking, arpeggio and fingerstyle guitar - examples of songs that are fingerstyle but in a modern way would be Tears in Heaven by Eric Clapton or Stairway to Heaven by Led Zeppelin. The Beginners Course includes "Greensleeves" which is a classical piece, as well as other fingerpicking ideas, and the Intermediate Course builds on these fingerstyle pieces more with some jazz, contemporary and other ideas. What is the minimum age the Course would suit? The Courses are suitable for children from about 10yrs. It is important to remember that any "self-teaching" process requires diligence and regular (every day!) practice - which is a step kids sometimes miss i.e. they presume that a couple of minutes here and there will make them a guitar player, which is unfortunately, not correct - 20mins daily is much better. I can already play quite a lot of things... how will your Courses help me? If you are already quite good at some basic skills, but still looking for more, you probably need some "structured" form of learning to give you the proper foundations. With your learning, a good question is how good is your knowledge of open chords... does the same apply to Barre Chords? The Beginners Course takes people right from the start, so a lot of it may be very easy for you, but also might fill in some gaps in your knowledge. If you are good at Barre Chords then the Intermediate Course might suit better with its extensive theory lessons and songwriting ideas. My teaching style teaches you skills and techniques as opposed to songs - you can then use the skills to play any song you like. What do you say about having a goal? You need to focus on a direction or goal. 1) Acoustic duo - all songs designed to be played well and performable on a single guitar. 3) Rock band. Electric based performance with modern rock songs. Each different type of gig has its own pieces and skills required - you need to ask yourself what are you aiming for? i.e. just to play at a campfire, or join a band? But having a firm goal is a great idea. Does the course suit left-handed guitar players? Yes, the course is suitable for left-handers. You learn the guitar in exactly the same manner as right-handers. The chord diagrams etc are a "mirror" image, but you soon get used to it. 99.99% of printed material (from any course etc) is in right-handed format, and I have plenty of leftie guitar students who have no problems. Can I get a discount for purchasing both courses together? Sure thing check out the pricelist page for a great package deal. What songs will I learn from the Course? With every course sold I will email a 40-song Ebook separately with many hit songs to accompany the DVD Course. It includes a grading system so you can tell which songs to play at about which level. Where else can I buy your Courses from? The courses are available from Amazon, Kobo, Barnes and Noble, iBooks and other major ebook retailers. Amazon offer the print version of the course book.